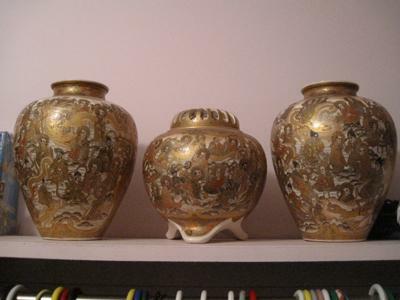 My mother is in possession of three Chinese vases. 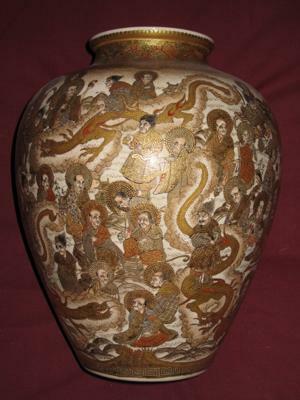 I believe my grandmother brought these Chinese Vases to England from China in the late 1800’s. We are wondering if they are valuable, what the markings mean, what they could be worth. I have several pics. I’ll post a couple. Kathy your vases appear to be a matched trio of Japanese Satsuma ware vases, very nicely decorated. 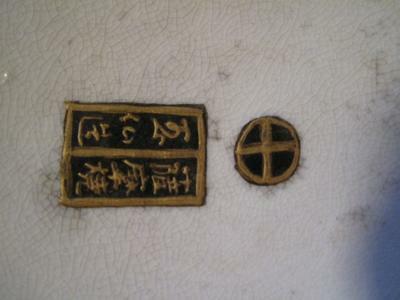 The Satsuma mark could be Satsuma, Gyokuzan with the Shimazu circular crest above the inscription. If so, they will probably date to the Meiji period (1868-1912). Satsuma ware mostly comes in a yellowish earthenware, decorated with Japanese figures including Samurai with expressive faces or detailed oriental landscapes. It sometimes includes dragons in relief. It was a Japanese export product designed in the mid-19th century for Western tastes. The Japanese themselves had very little interest in Satsuma wares. Value will depend very much on condition and the quality of the Satsuma decoration. Currently there are Satsuma vases for sale with prices that range between $95 USD and £1500 GBP. Or have a look for Japaneses Imari Porcelain for some basic comparisons. Take them to Sothebys on New Bond Street, London for a free valuation. You do not have to book an appointment and you can go on any day of the week. If you live outside London it is best to phone them first to confirm that they are open on the day you intend to visit.